Shade selection is an important procedure to provide patients with an aesthetic restoration that harmoniously blends to the patient's existing dentition. Normally, the shade of a dental restoration is selected by the dentist together with the patient. Sometimes, the dental technician may also participate in this operation. Porcelain provides a rich range of colors and the possibility of combining them to give artificial teeth a close to natural appearance. When porcelain restorations are designed, shade selection requires close attention. The shade of a restoration is selected with the help of the shade guide. The numbers design the chroma : the smaller the number the lighter the chroma. A natural tooth shows darker shades towards the gum and lighter shades towards the top. Porcelain reconstructions have the possibility of multiple shade combinations. From the shade guide, a base shade that best resembles the remaining teeth is selected. 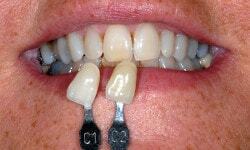 If the remaining teeth have different tones, a shade similar to the adjacent teeth is the best option. For best results, darker shades are selected for the gum (gingival) parts of the tooth and lighter shades for the areas towards the top (occlusal parts). A shade or chromatic map can be created. The map is divided into different sections to ensure correct placement of different shades, characterizations and chromatic effects. The image above shows a shade map. 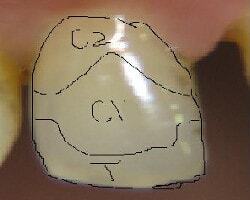 Observe that, in the upper part (near the gum) the recorded shade is (C2); in the middle of the tooth, a lighter shade (C1) which is normally the base shade and towards the top a light transparent shade (T). More than 3 different areas may be created on the shade map; some practitioners recommend dividing the teeth into 9 different sections. 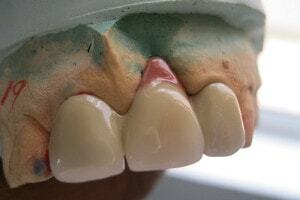 To make porcelain restorations less visible (from the other teeth), it is possible to mimic various stains or color changes that are present on adjacent natural teeth : nicotine stains, discolorations, abrasion, color changes caused by tartar and others. Various shades for chromatic effects are available in the porcelain kit. Sometimes, because of advanced bone loss or gum recession, the artificial teeth would appear to long and thus unsightly. In this situation, a red shade ceramic can be placed in the upper part of the tooth. The ceramic tries to mimic the gums and the tooth appears to have a normal height. In the image above a red ceramic was placed in the upper part of a tooth. This way, both central incisors appear to have the same height, which is of great aesthetic importance. !! 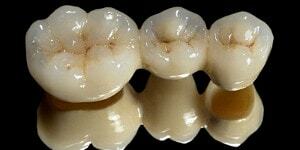 !The ultimate goal is to construct a restoration that will be very difficult to distinguish from the other teeth. It is not advisable to select a too white shade because this will accentuate the "artificial look" of the restoration.